Grab your audience by printing your message on a thin, durable and lightweight flexible EL vinyl panel that not only lights up but also provides eye-catching animation effects dramatically. 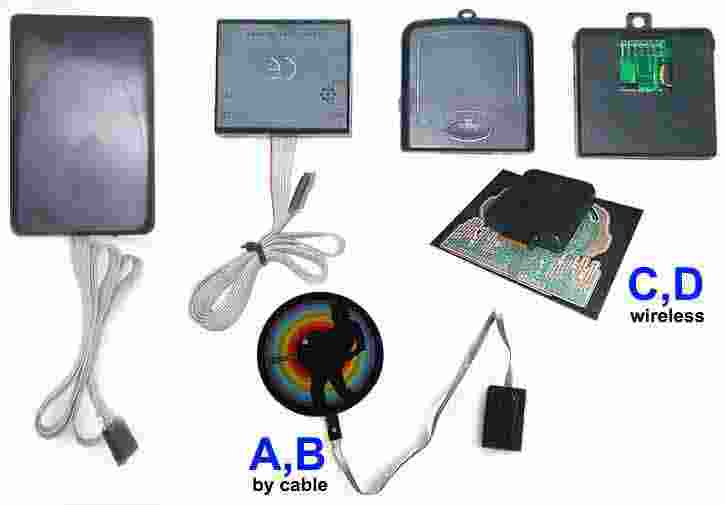 Can be operated on a battery pack. What are some of the applications where Animated EL is most effective? Attention-grabbing, colourful, animated point-of-sale materials: Backlit Signs, Illuminated and Animated Posters, X Banner, Trade show booths, Window displays, Clothing, Caps, Badges and buttons and safety items. An EL signage or poster can serve all purpose but a lot better than a traditional lightbox. Installation - No light box or heavy infrastructure involved. What is EL, and how does it work? EL, or electroluminescent posters/signage, is essentially a flashlight bulb sandwich consisting of layers of conductive and non-conductive plastic and a layer of phosphor. The phosphor is laminated between two conductive layers and,as a voltage is applied between the two conductive layers, or electrodes, the phosphor emits light energy. When a high-quality,high-resolution image is printed over the light, it behaves like a backlit. 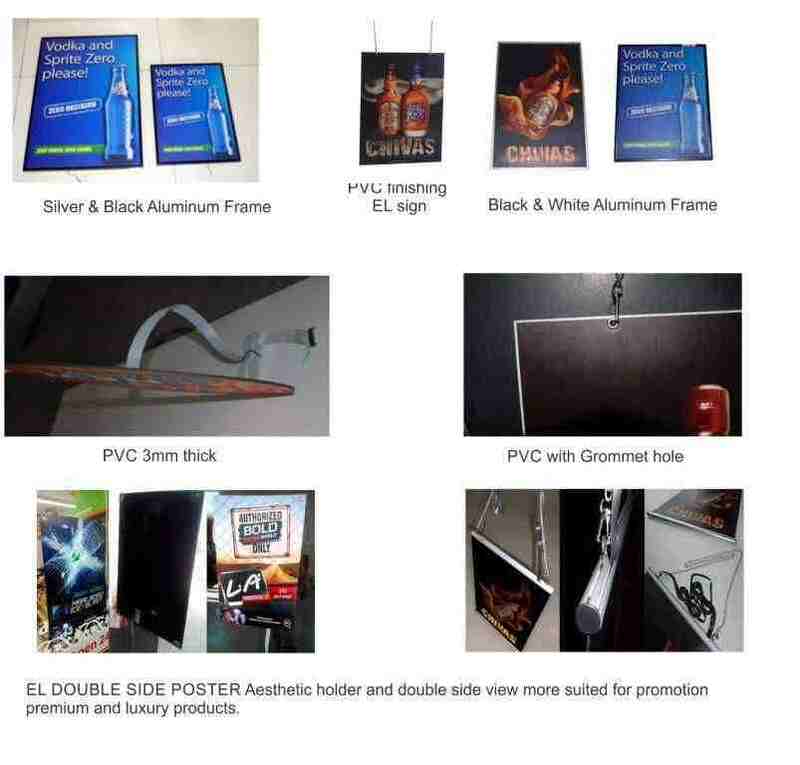 Electroluminescent panel based Aluminium frames are the best choice for advertising and photographic poster displays. The unique modern frame design bonded with state-of-the-art EL technology allow the bright backlit panel to present a true and crisp colour image that features powerful eye catching effects. 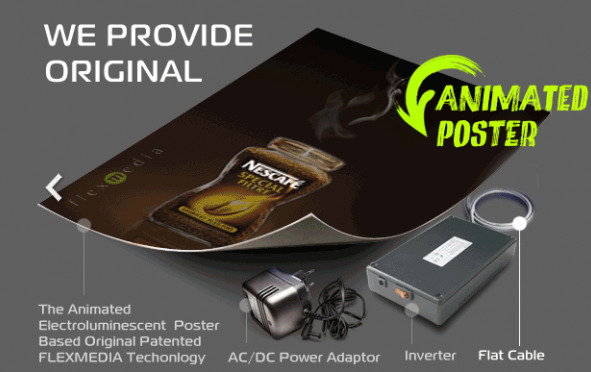 Electroluminescent poster based Aluminium frames are the best choice for advertising and photographic poster displays. The unique modern frame design bonded with state-of-the-art EL technology allow the bright backlit panel to present a true and crisp colour image that features powerful eye catching effects. We provide black slim aluminium frames that are 10mm wide. They can be easily hung on the wall with hooks on the back. The simple design makes the EL panel present a brilliant animation and powerful eye catching effect in such dark places like bars, restaurants, night clubs, casinos, and inside establishments.